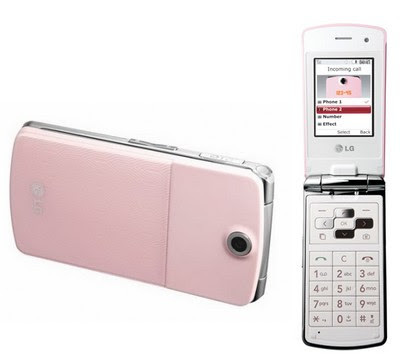 LG KF350 mobile phone is the new "Ice-cream" phone from LG. Its elegance and colour choice is such that it definitely targets the women. It is presented in light and soft colours like aqua blue, white and rossy pink. This clampshell ice cream like design tempts like an ice-cream. The device has a 2.2-inch TFT screen with QVGA resolution. Its in-built 3 MP camera, support for the largest picture resolution of 2048 × 1536 pixels. On the contrary, it supports 2GB micro SD card expansion which now seems somewhat inadequate. It measures 100.9 * 50.9 * 14.15mm and weighs only 102g, portability is true, even it is easy and can fit in a female hand. In music, the handset support the music formats such as MP3 player, and support for 3GPP (H.263) and MPEG4 format video playback. This allows the users to get a full on audio-visual entertainment. LG KF350 enters India at very cost-effective price and is certainly an option for guys who want to buy it for his girlfriend or his mother.